Little girls love playing dress up and here's a costume that is not just fabulous but it's right up to date too. This outfit is from the hit Disney Pixar film of 2012, "Brave" which is set in the Scottish Highlands and features Merida, a feisty and independantly minded Disney heroine (no prince required here) who defies an age-old custom, causing chaos in her kingdom. 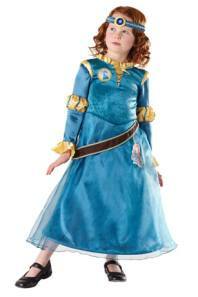 The officially licensed deluxe Disney costume includes a long blue and gold dress and a coordinating headband. If you're not lucky enough to have her beautiful red hair, there's a Merida wig available separately. The outfit comes in three sizes - small (age 3 to 4 years), medium (age 5 to 6 years) and large (age 7 to 9 years) and costs just £22.99 online.